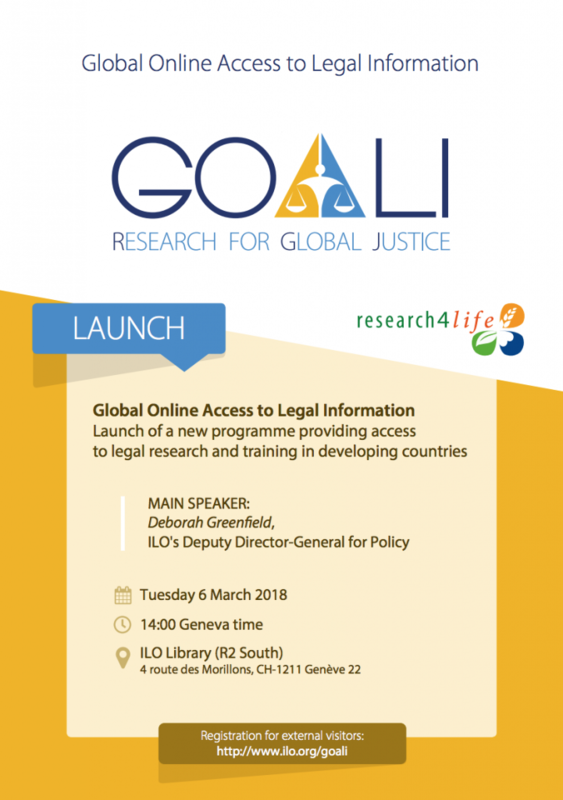 The International Labour Organization (ILO) and its partners will launch a new Research4Life programme called “Global Online Access to Legal Information” (GOALI), on Tuesday, 6 March. Recognizing the importance of access to legal information, the new programme gives free or low-cost online access to academic legal journals, publications and databases in more than 115 low- and middle-income countries. The programme will go live during an event organized for the occasion. It will provide an opportunity to introduce founding partners: Brill Nijhoff, the International Training Centre of the ILO and academic partners (Cornell Law School Library and the Lillian Goldman Law Library at Yale Law School). The main speaker will be Deborah Greenfield, ILO’s Deputy Director-General for Policy. The launch event will be held at the ILO Library, on 6 March from 14:00 to 14:45. Live video streaming of the event will be available on this page. If you are an eligible institution you can register to GOALI here.